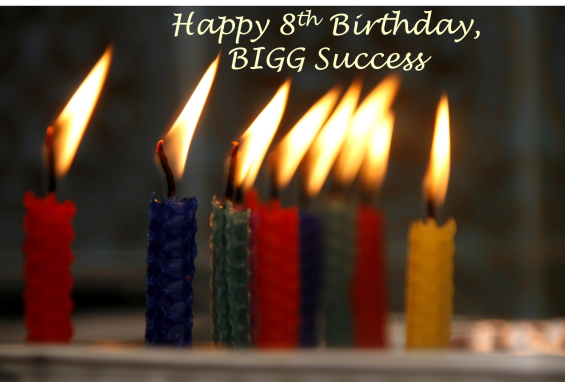 BIGG Success turns 8-years old today! It’s been an amazing experience working together as partners in life and business. That’s a lot of content! So as we discussed what to do for this special episode celebrating the eighth birthday of our baby, we decided to go back to the beginning. In the first episode of The BIGG Success Show, we discussed how to define success. We want to revisit that subject today and, hopefully, provide you with a unique point-of-view. Paraphrasing, he said success is peace of mind which comes from doing all you can to be all you can be. The positive psychology movement has been growing over the last eight years. We found it interesting when its authorities shifted from an emphasis on happiness to a focus on well-being. It seems to us like they’re coming in line with the idea of success stemming from peace of mind. Along the way, we arrived at a definition of BIGG success: It’s life on your own terms. We got there once we noticed that too many people spend too much time living a life they don’t want to live. Success is inner peace, which flows from three sources. #1) To be a BIGG success, you must find your calling and seek to fulfill it. What is your reason for being? And once you figure that out, the really important question arises: What are you doing about it? You see, living life on your own terms isn’t a selfish endeavor. Surprisingly, it’s less about you and more about others. Who are you serving? #2) To be a BIGG success, you must strive daily to live up to your full potential. Strive is such a perfect word. Achievements which come easily simply aren’t as fulfilling as those which where we face some struggles. You must learn. You must grow. And remember, for us humanoids, growth occurs just past the point where what we know intersects with what we don’t know. You have to stretch yourself. Now we’ll warn you – it isn’t always fun when you’re in the middle of the mess. But once you work it all out, you realize how much you’ve grown as a result. You’re able to serve more people or serve the ones you’re serving now better. #3) To be a BIGG success, you must stay true to your vision and values. You can’t get bogged down with things which don’t fulfill your calling. And you’ll never experience inner peace if you’re not proud of the man or woman you see in the mirror. A lot has happened during these past eight years. One of our favorites was a mention of a BIGG Success article on the Adobe Photoshop Blog. We did a post on the biggest regrets in life. It inspired Megan Orsi to become “the girl with the Photoshop tattoo” – not necessarily something we aspired to, but a notable occurrence nonetheless. Ultimately, inner peace comes from living a life with no regrets. Find your calling and fulfill it. Strive to live up to your full potential every day. And stay true to your vision and values. You’ll make a BIGG difference in the lives of others. And in so doing, you’ll see a BIGG difference in your life as well. That’s win/win. That’s BIGG success! We’ve met so many incredible people over the last eight years. We thank you so much for all of your support and encouragement. We look forward to getting to know you better through many more years of BIGG Success! Great show! Happy birthday to BIGG Success! Thank you for sharing in words what I am feeling inside and have been applying for the past 10 years. Business on the basis on serving! It has been taken form and continues to grow. Now I can share with others, extend the business with other and use your words. Thank You! Thank you Joyce. Here’s to your continued BIGG Success!